FOYLE MP Mark Durkan says concerns remain over non-devolved security issues including the role of secret intelligence service MI5 in Northern Ireland. Speaking after Monday (March 22) night's Westminster debate on the devolution of justice, the SDLP man said: "People talk about the 'completion' of the devolution of justice and policing, but we are not seeing a complete transfer of those powers. "The Patten Report was clear that intelligence gathering should be led by the PSNI. "At St Andrew's in 2006, Tony Blair and Gerry Adams threw this out the window and agreed that MI5 would have primacy. That must be put right. "Vital powers will still be reserved at Westminster in a way that leaves part of Patten unfulfilled." Speaking during last night's debate, Mr Durkan said: "The family of Kieran Doherty in my constituency recently lost a son, partner, nephew and brother to members of the Real IRA, who murdered him. "They left him stripped to his underwear with his hands taped behind his back, having shot him twice in the head. "It was a very chilling old Provo execution-style killing." Mr Durkan noted that Kieran Doherty's family totally repudiated and condemned the Real IRA for its actions but also referred to the family's belief that Mr Doherty had been approached by MI5 agents who were active in and around Londonderry in the months leading up to his murder. He added: "This is not some fanciful notion that I have conjured up about the possibility of concerns in the future. "These are not theoretical concerns, but real concerns. That man's partner told me in her grief at the wake that she had written a letter which she had not yet posted before he died. "The letter, addressed to the Minister of State, expressed her concern about what was happening to her partner - the harassment to which he was being subjected, and the offers that were made to him. "Mobile phones were thrown into his car, and he was told 'Ring Justin - Justin will be in touch with you soon.'" 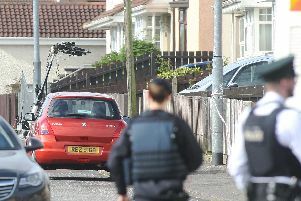 Mr Durkan said the Doherty family also believe people in PSNI uniform harassed in the months leading up to his death. "This raises fundamental concerns about whether or not policing will be transacted and conducted in the light of all the Patten principles and all the Patten promises, so we (in the SDLP) still have deep reservations about this dangerous twilight zone that exists in relation to the interface between national security, the regional policing interest and the full accountability of devolution." Questioning the NIO Security Minister Paul Goggins later in the debate, Mr Durkan said: "Will the Minister acknowledge that there is a family in my constituency who are grieving as a result of a recent murder by the Real IRA? "They have serious questions about MI5's involvement in the background to that murder - the interest to which it was subjecting that young man, the surveillance and the attention that it was giving him - and they are left believing that MI5 knows more about his murder than has been disclosed. "I know that the family got the opportunity to talk to the Secretary of State, too. "This is a very real issue in that context. Does the Minister acknowledge that and how does he see it being addressed? What assurances can he give that family?" NIO Security Minister Paul Goggins replied: "The devolution of policing and justice is about isolating those who would carry out such a dreadful deed. "I bitterly regret the attack that was carried out on his constituent and I understand the distress and hurt that has been caused by that. "If he wishes to pursue the issue with me beyond the debate I will be more than happy to do so - he knows that - and if there are things that "I can do to support him and his constituents, I will be happy to do them. "I can reassure him that the police are investigating that vile murder. "If there are views that the family want to bring to my attention, I ask him please to encourage them to do so. I would be happy to meet him and to discuss that further."